The following feature was added in QuoteWerks 4.5 Build 1 that was released on 12/15/2009. On the Misc tab of the Tools|Options menu, there are new File Generation options. 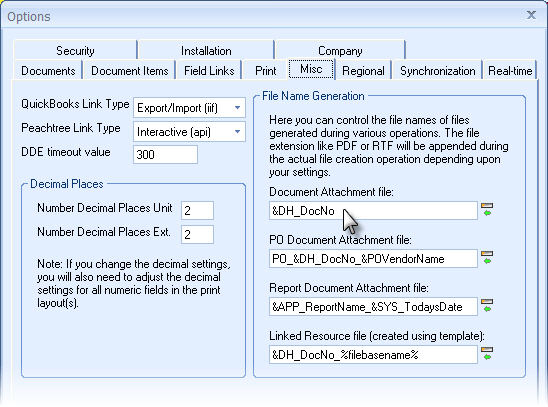 Here you can control the names of files created during various operations. For example the Document Attachment file is the file that is created when you email a quote. This file may be saved in .pdf or .rtf format depending upon your settings. Before, this file name was simply the document number like AAAQ1001.pdf. Now you can completely control the name of the file to make it more meanful to you and your customer. You can do this using macros like "Document_&DH_DocNo_&DH_DocName" which would result in a file name like "Document_AAAQ1001ChicagoLocationManagedServices.pdf".